Static program verifiers such as Spec#, Dafny, jStar, and VeriFast define the state of the art in automated functional verification techniques. The next open challenges are to make verification tools usable even by programmers not fluent in formal techniques. 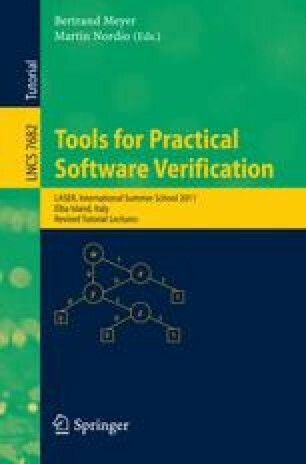 This paper discusses some techniques used in AutoProof, a verification tool that translates Eiffel programs to Boogie and uses the Boogie verifier to prove them. In an effort to be usable with real programs, AutoProof fully supports several advanced object-oriented features including polymorphism, inheritance, and function objects. AutoProof also adopts simple strategies to reduce the amount of annotations needed when verifying programs (e.g., frame conditions). The paper illustrates the main features of AutoProof’s translation, including some whose implementation is underway, and demonstrates them with examples and a case study.